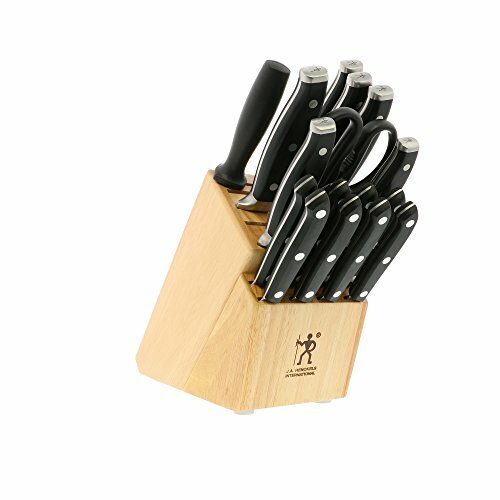 The Henckels International Forged Premio 17-pc Knife Block Set has a knife to handle every kitchen task. Fabricated from high-quality German stainless steel, the fine-edge blades are perfect for precision cuts. The all-rounder 8" Chef's Knife is ideal for chopping herbs and dicing onions while the 5" Serrated Utility Knife cleanly slices through tomatoes. Perfectly peel apples with the small 3" Paring Knife. The forged bolster construction seamlessly transitions from blade to handle for durability and balance. Curved for comfort, the triple-rivet handle features a stylish, stainless steel endcap that adds aesthetic appeal to your knife block. Stamped with the single man Henckels' logo, this Halberdier symbolizes Forged Premio's superb quality at a remarkable value. Henckels International makes essential kitchen tools every home chef needs. From steak knives to spatulas, every product boasts high quality at an exceptional value. Created in 1895 by Zwilling J.A. Henckels, this value-driven brand guarantees the same durability, design and ease of use for which the global company is known. Equip your kitchen with expertise with Henckels International. Set includes 3" Paring Knife, 5" Serrated Utility Knife, 5.5" Boning Knife, 7" Santoku Hollow Edge Knife, 8" Chef's Knife, 8" Bread Knife, 9" Sharpening Steel, Hardwood Block, 8 - 4.5" Steak Knives (stamped), and Kitchen Shears.